Hazrat Musleh Maud (may Allah be pleased with him) once said that great achievements are wrought by prayer whereas people skilled in mesmerism/hypnotism can also bring about changes in people through their knowhow but these changes are temporary and individual and they do not bring about revolutionary advantages. However, when prayer is made with all its due requisites it can turn around fortunes of nations. 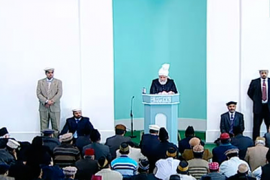 Hazrat Musleh Maud (may Allah be pleased with him) narrated an account from the life of the Promised Messiah (on whom be peace) regarding Sufi Ahmad Jan Sahib. Sufi Sahib had spent many years serving a Pir and performed spiritual exercises and endeavours. Later, he became devoted to Hazrat Mirza Ghulam Ahmad (on whom be peace) whom he identified before his claim that this person would be the Messiah. Before his claim of messiahship the Promised Messiah had written his book ‘Baraheen e Ahmadiyya’ which gained huge popularity among saintly and scholarly Muslims. When Sufi Sahib, who was one of the most God-fearing holy people of his time, saw the Promised Messiah’s (on whom be peace) poster he started correspondence with him. Sufi Sahib was a most devout person who had also gained mesmerism/hypnotism skills. He requested the Promised Messiah to let him know next time he visited Ludhiana so that they could meet. He invited the Promised Messiah (on whom be peace) to his place for a meal and as they walked back together after the meal Sufi Sahib told the Promised Messiah (on whom be peace) that he had served a Pir for a number of years which had given him so much power of concentration that if he focussed and concentrated the person walking behind them could fall over. Hearing this, the Promised Messiah (on whom be peace) stood still and slowly raked the ground with the tip of his walking stick. He raked the ground with the tip of his walking stick whenever he felt passionately about something. He asked, Sufi Sahib, if the man were to fall over, how would it benefit you or him? Sufi Sahib had a great foresight. He pondered over it deeply and said that he repented and would abandon this practice. He said he now realised it was a worldly practice and was not something spiritual. He had it announced that none of his followers should consider the practice as part of the faith of Islam but should consider it a worldly practice. Sufi Sahib’s farsightedness is evident from the fact that when the Promised Messiah (on whom be peace) wrote ‘Baraheen e Ahmadiyya’ Sufi Sahib realised that he was going to go on to become the Promised Messiah although God had not yet revealed it to Hazrat Mirza Ghulam Ahmad (on whom be peace) that he was going to go on to make any claim. Sufi Sahib wrote an Urdu poetic couplet to Hazrat Mirza Sahib in a letter: ‘We, the ailing look up to you alone, For God’s sake be the Messiah!’ God had told him about the Promised Messiah (on whom be peace) therefore before passing away Sufi Sahib advised his children to accept Hazrat Mirza Sahib when he made his claim. Hazrat Musleh Maud (may Allah be pleased with him) said that the resolve and focus of hypnotists is nothing compared to the resolve and focus of faith and cannot stand before it. God-given resolve and focus and any individual’s resolve and focus are worlds apart. Once as the Promised Messiah (on whom be peace) sat in Masjid Mubarak addressing a gathering a Hindu accountant from Lahore came by. He was a skilled hypnotist and had come with the intention to hypnotise the Promised Messiah (on whom be peace) while he was in a gathering to, God forbid, make him dance. This Hindu person had himself narrated this account to an Ahmadi. It so happened that the Promised Messiah (on whom be peace) gave one of his books to an Ahmadi from Lahore and asked him to deliver it to a particular Hindu person. When the Ahmadi took the book to the Hindu, he explained that he was a skilled hypnotist. If he wanted he could hypnotise a stranger walking on the road and make him run after the horse carriage the Hindu would be riding. He said he had heard a lot about the Promised Messiah (on whom be peace) in terms of his books against Hinduism so he decided to disgrace him before his followers. It is with this intention he went to Qadian and sat by the door in the mosque where the Promised Messiah (on whom be peace) held an assembly. He tried to focus on his hypnosis technique but saw it had no impact on the Promised Messiah (on whom be peace) and he thought he must be a man of unusual resolve so he decided to focus that much more on his technique. Still, nothing happened. Not wishing to give up, he tried all that he could muster to try and hypnotise the Promised Messiah (on whom be peace). This is when he saw a lion ready to pounce on him. Frightened, he gathered his shoes and ran. The Promised Messiah (on whom be peace) sent someone after him. The Ahmadi chased and caught him. The Hindu said, please let me go now, I am not in my senses. I will later write a letter to Mirza Sahib. Indeed, he later wrote to apologise for his impertinence and said he had not recognised the high station of the Promised Messiah. Someone asked him why he had assumed that Mirza Sahib would not know the art of hypnotism perhaps more than him and could counter his technique! The Hindu replied hypnotism requires one to be focussed and quiet while Mirza Sahib was addressing the meeting when I tried to hypnotise him, so his strength was from the heavens. Power of resolve which man learns by himself is like child’s play when compared to power of resolve granted by God as indeed it was evident in the account of Hazrat Musa (on whom be peace) the sorcerers and serpents. Hazrat Musleh Maud (may Allah be pleased with him) said it is important to absorb all truths in order to progress as a community. It is not simply sufficient to accept death of Jesus (on whom be peace) in fact one should reflect over death of Jesus and try and understand why is it important to accept it! For one, the belief of Jesus being alive, is indicative of Jesus’ excellence over the Holy Prophet (peace and blessings of Allah be on him) although no Prophet of God had the glory of the Holy Prophet (peace and blessings of Allah be on him). So, this thought is against Islamic belief and a thought we cannot entertain for a minute. To accept that while the Holy Prophet (peace and blessings of Allah be him) is buried below earth Jesus (on whom be peace) is residing on fourth heaven is great violation of Islam. Secondly the idea of Jesus alive in heaven affects the concept of Unity of God, His Oneness. Had these points not been there we would not have cared if Jesus (on whom be peace) was in the heavens or on earth. But how can we abide by irreverence towards the Holy Prophet (peace and blessings of Allah be on him) and something that is contrary to Oneness of God. Hazrat Musleh Maud (may Allah be pleased with him) says it seems ordinary Ahmadi do not feel passionately when discussing death of Jesus (on whom be peace). He says he has seen the enormity of passion felt by the Promised Messiah (on whom be peace) when he discussed the matter of death of Jesus. He would quiver with the strength of emotion he felt and his voice would be majestic as he explained that he had removed a huge impediment in the way to progress of the world. The world was in darkness and he was taking it towards light. Seeing the Promised Messiah (on whom be peace) in such fervour it felt that he was reclaiming the throne of the Holy Prophet (peace and blessings of Allah be on him) from Jesus (on whom be peace). When God grants a high spiritual station to someone He Himself guides them. They receive guidance which cannot be directly called revelation but it cannot be disassociated from being revelation either. This guidance is not based on words but is received in the form of some action. It is as if God’s light descends on the person’s heart and unfolds matter to them. The Promised Messiah (on whom be peace) used to say that when he comes across many people he appears to see rays of lights as if coming out from them which make him aware of the hidden failings or good qualities of the persons. But he did not have the permission to disclose this to the people. It is the way of God that unless and until a person himself causes his failings to be disclosed he is not considered guilty. It is in keeping with this that Prophets of God and people who come in their reflection (and follow them as closely as shadow follows a person) also do not disclose the inner failings of others unless people themselves cause the failings to become evident. Hazrat Musleh Maud (may Allah be pleased with him) writes that the Promised Messiah (on whom be peace) visited Lahore in 1904. He addressed a convention during this visit. There were some non-Ahmadi guests present at the convention who narrate that as the Promised Messiah (on whom be peace) spoke he saw a large column of light as if emerging from the Promised Messiah’s head and heading skywards. He mentioned this to the person sitting next to him who also saw the column of light. This experience left a huge impact of them and they accepted Ahmadiyyat on the same day. Hazrat Musleh Maud (may Allah be pleased with him) writes that he remembers once someone wrote to the Promised Messiah (on whom be peace) saying his sister was possessed by Jinn and the Jinn say that they are ready to accept the Promised Messiah. The Promised Messiah (on whom be peace) wrote back and said give the Jinn the message as to why are they bothering a woman. It they had to harass anyone, they should visit Maulawi Muhammad Hussain Batalwi or Maulawi Sana Ullah!!! Hazrat Musleh Maud writes that of course the commonly held concept of Jinn is not correct. Of course people educated in the English medium would be convinced that there were no such things as Jinn. However, a believer does not accept matters only through his power of reasoning but looks at the truth of the Holy Qur’an. If the Qur’an backs the commonly held concept of Jinn then we would say: We believe and we testify to the truth! However, if it is proven from the Qur’an that there is no other creation other than mankind, then this has to be accepted! The Promised Messiah (on whom be peace) used to narrate an incident that once on his visit to Lahore some friends insisted to visit a majzoob (mentally ill ascetic) who lived in Shahdara, a town just outside Lahore. Other friends were not keen on the idea of going because they said the majzoob utters profanities. However, those in favour of going insisted that as the Promised Messiah (on whom be peace) was a recipient of Divine revelations it would be interesting to see what the majzoob said. The Promised Messiah (on whom be peace) declined to go but friends somehow took him to see the man. When they met the majzoob he was uttering profanities but he suddenly stopped. He offered a melon to the Promised Messiah (on whom be peace). Those who are easily swayed by apparent matters were more convinced about the majzoob although the Promised Messiah (on whom be peace) said that he was mentally ill. Sometimes a mentally ill person can see something that a sensible person cannot; because they are cut off from the world they can decipher matters of the unseen. With reference to signs of the Promised Messiah (on whom be peace), Hazrat Musleh Maud said that all accounts of the times of the Holy Prophet (peace and blessings of Allah be on him) are not on record, otherwise there would have been hundreds and thousands of examples of his signs. As atheism is rampant in the time of the Promised Messiah (on whom be peace) God has shown many signs for him which we can assume to be those of the Holy Prophet (peace and blessings of Allah be on him). One sign is that of a student named Abdul Karim who had travelled all the way from Hyderabad Deccan to receive religious studies in Qadian. He was bitten by a rabid dog and was sent off for treatment. Initially he felt better but then fell ill again and eventually doctors said nothing more could be done for him. When the Promised Messiah (on whom be peace) was informed of this he was saddened that a young man who had travelled long distance to come to study religion had fallen ill. He prayed most compassionately for Abdul Karim. The Promised Messiah said his mother had sent him to school with so many hopes. The Promised Messiah’s (on whom be peace) prayers cured Abdul Karim of something that had no treatment at the time! Hazrat Musleh Maud (may Allah be pleased with him) said that a doctor friend of his told him that during his student days he was discussing existence of God with a fellow student when he narrated the incident of Abdul Karim’s healing as a proof of God accepting prayers. His fellow student responded that it was not a big thing; people who were bit by rabid dogs could be saved. Incidentally the same day rabies was the topic of lecture at college. Their professor stressed on prompt treatment after being bitten by a rabid dog and said that if prompt treatment was not given and the patient started suffering from violent movements, the disease became fatal. The Ahmadi student tried to clarify with the professor that some people said rabies could be treated. The professor responded sternly that no, it was beyond treatment. Yet we know that Abdul Karim was healed of it. Once two men and a woman from USA visited the Promised Messiah (on whom be peace). The men discussed the Promised Messiah’s (on whom be peace) claim with him. Jesus (on whom be peace) came up during the conversation. The man said he was god. The Promised Messiah asked what proof he had. The man said Jesus showed miracles. The Promised Messiah said that he too showed miracles to which the man asked him to show a miracle. The Promised Messiah (on whom be peace) remarked you are one of my miracles! The man asked how so. They Promised Messiah (on whom be peace) said Qadian was a small, unknown village where even ordinary food stuff was not available, people could not even buy flour there. It was at that time that God had informed the Promised Messiah (on whom be peace) that He would exalt his name and people from far-off places would visit him. ‘So many people will come to you that the track by which they come will deepen. And the help will come to you by every distant track, and such tracks will deepen by the travelling of the people who will walk on them.’ [Tadhkirah, p. 725] The Promised Messiah (on whom be peace) said to the man, see, how the avenues have opened up and you have visited me from USA! What connection did you have with me? This indeed is a sign of my truthfulness. Hazrat Musleh Maud (may Allah be pleased with him) says that he remembers at the time people were astonished as to what answer would the Promised Messiah give to the man from USA, they thought he would probably explain the concept of miracles to him. However, the Promised Messiah (on whom be peace) gave him a different answer! Hazrat Musleh Maud (may Allah be pleased with him) says that although the Promised Messiah (on whom be peace) said there were hundreds of thousands of signs in his corroboration, Hazrat Musleh Maud felt the signs were in fact countless. Those with understanding knew that hundreds of thousands of signs could be deduced from a single revelation of the Promised Messiah. People came to see the Promised Messiah (on whom be peace) after he made his claim and they benefitted from his company. The wise see great signs of God even in small matters and the foolish do not see anything even in large scale matters. Indeed, the entire locality of Qadian and all that there is in it is a sign of the truthfulness of the Promised Messiah (on whom be peace). His own estimation of the number of his signs was very modest. His signs are so many that they are beyond human comprehension and only God can measure them. Once a Maulawi came to the Promised Messiah (on whom be peace) and said he had come to see his sign. The Promised Messiah laughed and said have a look at my book Haqiqatul Wahi and you will realise how many signs God has shown in my corroboration. What benefit have you derived of the signs in Haqiqatul Wahi that you have now come to see more signs. May God give insight to those who do not see the signs of the Promised Messiah (on whom be peace) and may He also make us stronger in faith by the minute!